How can the creative community advance race equity in the theatre? How do artists and producers agree to work together to eradicate yellowface and brownface? What are lessons learned that can be shared? If you're in New York, you're invited to Beyond Orientalism: The Forum, an interactive public event featuring panel conversations, a breakout session and multimedia components to explore these questions. 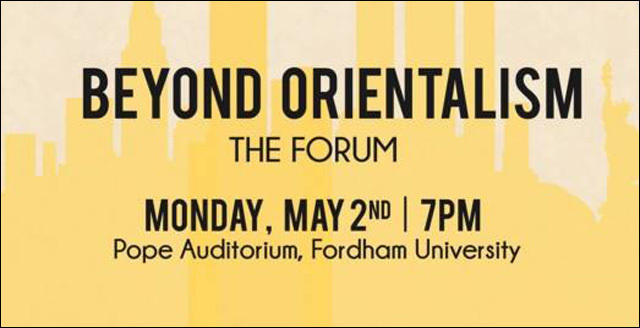 Beyond Orientalism: The Forum is presented by the Asian American Arts Alliance, Asian American Performers' Action Coalition, Theatre Communications Group and Alliance for Inclusion in the Arts, with the Fordham University Theatre Program. It's happening Monday, May 2 at Pope Auditorium at Fordham University. How can we as a community advance race equity in the theater? How do we agree to work together to address yellowface and brownface? Join us on Monday, May 2nd to explore these vital questions. This interactive public event, in which every attendee will play a role and have a voice, features panel conversations, breakout sessions, and multimedia components. Confirmed panelists include: director Nelson Eusebio, actor Mia Katigbak of NAATCO, James C. Nicola of New York Theatre Workshop, Neil Pepe of Atlantic Theater Company, director/choreographer Randy Skinner, playwright Lloyd Suh, David Wannen of NYGASP and Chay Yew of Victory Gardens! The panel will be facilitated by founder and artistic director of artEQUITY Carmen Morgan. The Beyond Orientalism conversation began in November 2015 with an unprecedented gathering of Asian American theater artists in response to the persistent practice of racial impersonation in the American theater. That conversation led to Beyond Orientalism: The Forum, which is the launch of a national initiative to directly address the negative effects of yellowface and brownface in U.S. theatre, while advocating for diverse representation of Asian Americans – and all characters of color – on our stages. The event is supported in part by the New York Council of of the Humanities. Please follow and share #MyYellowFaceStory on social media leading up to the May 2nd Forum. We hope to see you there! The event if free, but RSVP is required. For further information about the event, visit the Facebook event.